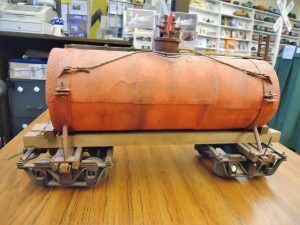 New models and a rustic kit bash by master modeler Randy German are now on display at the Bellingham Railway Museum. These are an addition to the models in his collection that are already on display. We have now been lucky enough to complete the collection and are so excited to be able to share them with the public. 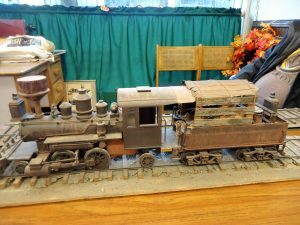 In the 1990s Randy German began to build models based on the trains and equipment used in the Northwest lumber industry in the early 1900s. Randy had experience earlier in his life with mechanics, engineering, and with fabrication while working on motorcycles and other projects (including an electric car designed and built with a friend). Randy used his ingenuity and skill to fabricate any of the parts he needed to create his scale models whether they be castings or machined parts. Randy built most of his models without plans and only by looking at small black and white photographs of the early trains and equipment. Come see the rest on display in the museum now. This entry was posted in Uncategorized on October 28, 2016 by Shelissa Griffin.